This Mint.com review was written by our guest Jim from AcceleratedFI. Enjoy! Everybody knows that personal finance 101 means creating a budget and sticking to it. After all, if you don’t understand where you’re spending your money, how will you ever be able to increase your savings rate and retire early? Creating a budget can be like staring at a blank piece of paper. You don’t know what’s “good” or “bad” and you don’t even know where to start. This can lead to ‘analysis paralysis’ where you get stuck planning for perfection and never get moving. Thankfully there’s a better solution! 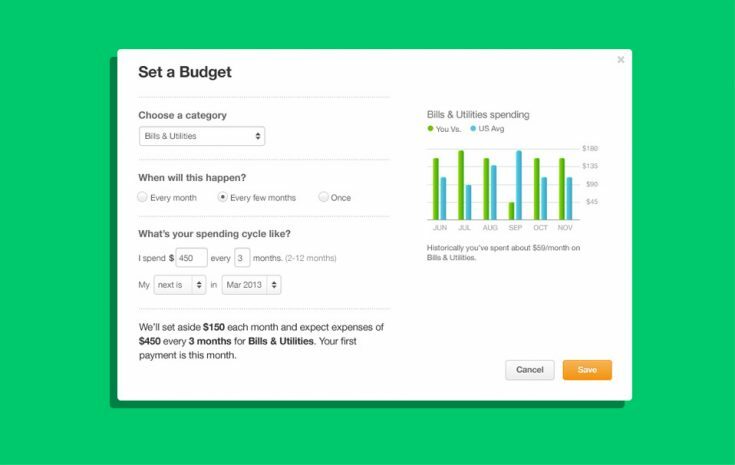 Mint.com brings budgeting and tracking your expenses into the 21st century. By automatically importing every transaction you make and applying the correct categorization, tracking your budget is relatively effortless. Mint.com is straight forward to use, and their introduction takes you through all the steps you need to get up and running. It is similar to other automated programs (like Personal Capital) and is a great option for those who are searching for alternatives to Quicken. Upon joining Mint, the first thing you need to do is add your accounts. I use a small local credit union in Michigan and was still able to instantly connect to Mint.com and start importing all my transactions. You’ll want to make sure to add every account where you either receive or spend money. Mint is great for tracking expenses, but you can take it to the next level once you start tracking your income as well. After you get your accounts hooked up and import all of your transactions, it’s time to set up a budget (don’t be scared)! Creating a budget with Mint is as easy as connecting all of your accounts, but you’ll have to put a little more effort into it to shape your budgets to match your habits. The first thing to do is enter your monthly income. This is the amount you make after taxes, 401(k) savings, health care deductions, etc. are taken out. This should be the amount of money that gets deposited to your account that you have total discretion over how it gets spent or saved. Note: If you get paid bi-weekly, you actually get paid 26 times per year; so, twice a year you’ll be paid three times in a month instead of twice. Be sure to account for that by calculating your average monthly after-tax income for your budgeted income. 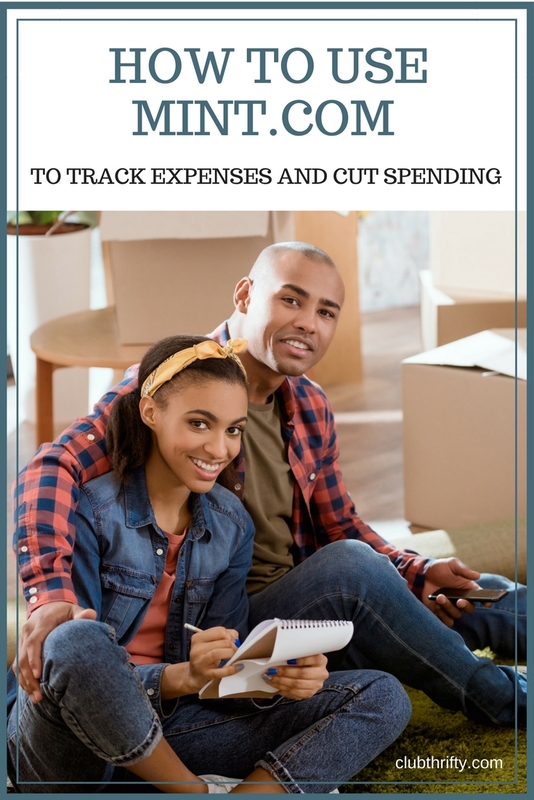 After you get your income entered, it’s time to add up your expenses. As you add your expenses to your budget, Mint will let you choose if you want to start each month with the previous month’s balance rolled over. This is really useful for bills like electricity, gas or gifts that can fluctuate at different times of the year. If you know you spend $500 every year on Christmas gifts, then you can budget about $40 per month. Mint will keep track of all those months where you spend $0 on gifts, so – when you get to December – you’ll have that entire $500 waiting to be spent. Getting your expenses set up correctly can be a little painful because you have to be honest with yourself. With that said, try not to be too hard on yourself, either. Just take your best guess, and don’t worry about getting everything perfect. You can always go back and adjust your budget later if you find out you were a little off the mark. Most people have no idea where their money goes. If this is you, don’t worry! In a few minutes, you can easily see where your money is going and get a rough idea of what your budget should be for each category. Mint’s budgeting tool is really powerful and comes with several predefined categories that apply to almost everyone. These are things like mortgage, bills, groceries, restaurants, etc. However, one of the best features of their budgeting tool is the ability to create custom categories. This is a nice feature that sets it apart from other Mint alternatives. If you want to save for a trip to Fiji, add it as a custom category. Want to save for new windows or a new roof on your house? Custom category. Use as many categories as you need to get your budget to match what you are planning to do with your money. Don’t worry about getting it perfect, just get it close. You can quickly and easily change any number you enter in your budget. If you plan for $100 per month in fast food but realize you’re actually spending $200, don’t worry; just up your budget. It’s important to be realistic with your budget. If you are consistently going over budget in one category, then you need to increase it so you can plan for those expenses. Be honest with yourself. Now that you have a budget set up, you’ll want to check the ‘Transactions’ tab to see what Mint is importing. It’s vitally important that you check this and correctly categorize all of the transactions. In my experience, Mint gets 95-97% of the transactions correct. The other 3-5% I have to go in and adjust manually. The good news is, after a couple times of correcting categories, Mint will learn from your changes and categorize those transactions correctly in the future. Cool, right? After you have everything categorized correctly, you should be able to see exactly where your money is going. 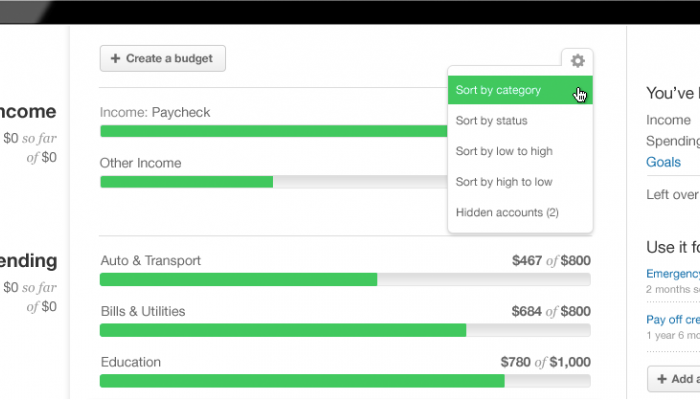 Mint uses a nice color coding system to show you anything that’s over budget or under budget. Budget categories that have a green bar are under budget and categories in red are over budget. The obvious place to start hunting is in any category where you are consistently going over your budget. Most people know how much they’ll spend each month on their cell phone bill, mortgage/rent, car insurance, cable, internet, etc. The area that usually fluctuates the most is in groceries/eating out and the all-encompassing ‘Everything Else’ category that Mint so helpfully provides. The ‘Everything Else’ category is everything you spend money on that you didn’t define a specific category for in your budget. It’s OK to have this category there; it’s almost impossible to have a category for everything. If you created a category for every single thing you bought, your budget would be gigantic and hard to use. Make sure the ‘Everything Else’ category gets a number assigned to it. Just like you budget money for your monthly phone bill, you need to have a monthly allowance for all of those miscellaneous expenses that pop up. Just because they aren’t uniquely separate doesn’t mean they’re any less important. In fact, the biggest thing that eats into many people’s savings is the small purchases they make here and there that go untracked and add up over time. 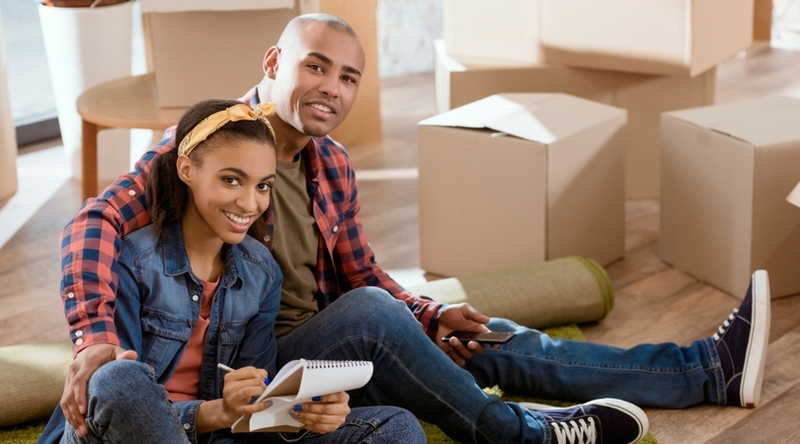 While you’re getting a feel for how your spending falls into different categories during the first few months, you may find that you over-budgeted for groceries and car maintenance but under-budgeted for your electric and gas bill. However, after 4-6 months you should begin to have a really good idea of where your money is going and which categories you’re seeing high spending. These are the categories we’re going to focus on and drill into to find the real money-saving opportunities. Inside your budget page, you can click on an individual category to show you all of the transactions in that category for the month. This allows a deep dive into categories that are going over budget so you can nail down what you bought that put you there. If it happens once, it’s probably not a big deal. However, if you’re consistently seeing specific categories going over budget, then you need to look at the individual transactions that are causing the overages. Once you identify these budget destroyers, root them out and eliminate them. This part is tough and might take a lot of time and practice, but budgeting is a lifelong endeavor. Nobody creates a budget and magically sticks to it every day for the rest of their life. It’s a learning curve, and it takes experience and self-control to stick to your budget and get your spending on track. Now that you understand how to set up your budget, the only thing left to do is get into it and make it happen! Go to Mint.com right now and create an account. Get your accounts connected and create your budget. Remember it doesn’t have to be perfect, it just has to be started. Getting started is the hardest part. Once you overcome that, you’ll be well on your way to mastering your money and cutting your expenses through smarter budgeting. If you’d like to see more articles by Jim you can check his website out at AcceleratedFI which focuses on starting side hustles and earning more money so you can retire earlier. I loved and used Mint when for several years. I first signed up when I was 18 and in my first year of college. It was free and easy to use and it made me more conscious of my spending. Although I did sign up for the free trial of YNAB and I’m LOVING it so far. We’ll see which one wins and gets to be my go-to budget resource! We tried using budgeting software (including Mint) but as two sick people our expenses were just too variable. Things have settled down a little, so maybe it would be easier now, but we prefer to simply work from a set amount of money rather than categories. It’s much less of a headache for me than keeping track of several different spending departments. But I’ve heard lots of people who love it for their own purposes! Love using Mint! It’s so easy to just add everything in, set my budget, and watch how everything is working right at my fingertips. I’m usually a paper and pen person, but Mint is one of the few apps that I can’t imagine living without! Great read. I was wondering how Mint worked. I still do it the old fashioned way with pencil and budget book. I have to say my hesitation using these new budget tools is in the linking of all my accounts to them. With all the hacks lately, I just don’t like the idea of a single platform knowing all my financial info. Other than that I can see how Mint could save time and serve as a motivational tool for someone who struggles with budgeting.